As I first approached the tour entrance to the Walt Disney Family Museum in San Francisco back in 2010, I was pleased to be greeted by this quote: "The greatest wealth a man may acquire is the wisdom he gains from living..." It is the opening line from Walt Disney's film, So Dear to my Heart (1949). My mother shared the film with me when I was a child, and for me, it is the film I think of when I think of Walt Disney. It is the story of a young boy's life growing up in a rural Midwestern town. Walt Disney, himself, grew up in such a town (Marceline, MO) near the turn of the century. It was a time when steam trains skirted rural fields alive with barefooted children. Disney once wrote, "To tell the truth, more things of importance happened to me in Marceline than have happened to me since or are likely to in the future." The sheer elegance and beauty of So Deart to My Heart's opening animation is the basis of this posting. In his latest edition of interviews with Disney artists, Don Peri has - yet again - brought fresh information to the world of Disney. 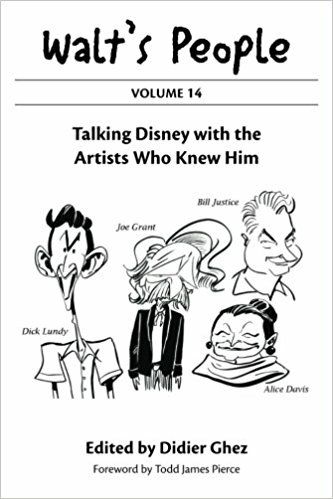 The many artists included in Working with Disney not only share their personal dealings with Walt (from interviews conducted nearly three decades ago by Peri himself), but provide insight into some of the specific projects they worked on. In his 1978 interview with Marc Davis, Peri reminded Davis of his involvement with story on So Dear to My Heart. Davis recalled that he did not do animation on the picture, but played a part in developing the "scrapbook" stories. The scrapbook belonging to young Jeremiah Kincaid (Bobby Driscoll's character) is what Davis was referring to, and it played a brief - yet vital - part in the film. From the very moment the film begins, we are introduced to this book of memories, and hear for the first time a grown Kincaid narrate and sing heartfelt memories of childhood past. It is here that the animation gently sweeps us away - revealing a time of early Americana when folks actually took the time to appreciate the change of seasons. Peri's interview was just one of two reminders of So Dear to my Heart's animated introduction. The second actually came to me by mail several years back. As mentioned in previous posts, Disney artist Ron Dias often times sent me packages containing artwork of his own and samples of others. 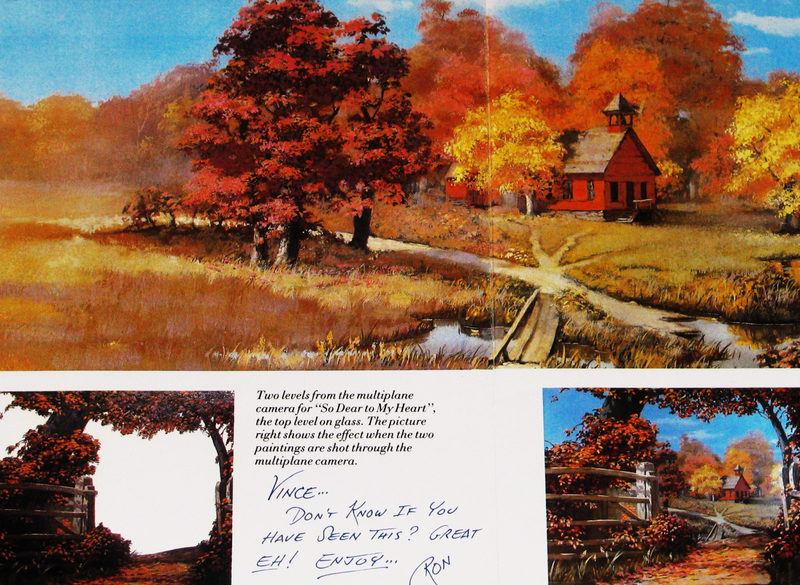 This package happened to include the image below (not done by Ron), and as one can see, it reveals how the opening autumn scene in the film was layered to create moving art with extreme depth. It's this specific segment of the opening that sets the animation in motion. As the first leaf falls, the camera slowly moves in, immersing us in the memories and surroundings of Jeremiah Kincaid's childhood. In closing, it doesn't pay for me to describe in complete detail every piece of this animated segment. For me, this is one of those special Disney moments; a moment that somehow captures the essence of, perhaps, a better time.